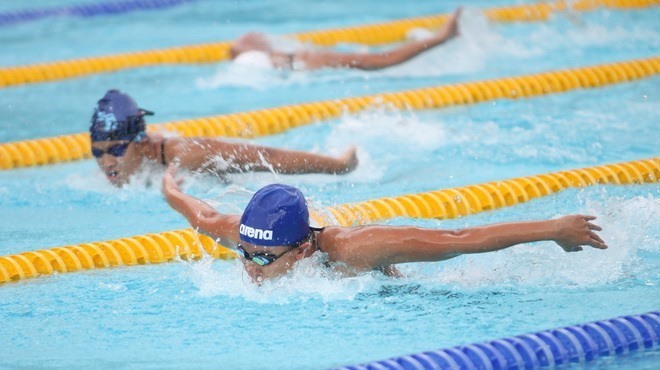 HÀ NỘI — HCM City topped the medal tally at the National Swimming Championship which ended in Huế City yesterday. The team bagged 17 golds, eight silvers and three bronzes. Quảng Bình came second with seven golds, four silvers and two bronzes, while Long An placed third with five golds, six silvers and eight bronzes. The Hà Nội team struggled with only two bronzes, while hosts Thừa Thiên Huế Province ranked bottom with a single bronze. On the last day, Nguyễn Huy Hoàng of Quảng Bình set a new national record in the men’s 1,500m freestyle with a time of 14:44.53, breaking the old record of 15:00.33. Earlier, the 18-year-old swimmer also set a new national record in the men’s 400m freestyle and 200m butterfly.